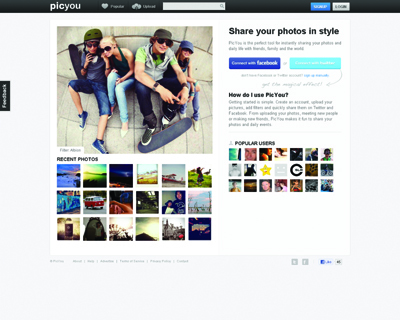 In a nutshell PicYou.com is web based application offering users an easy to use and fun platform for instantly sharing photos online including integration with social media channels, custom filter effects on upload to enhance images, and social networking attributes that take the idea of a photo sharing platform a step further. The idea is similar to the iPhone app Instagram but enhances the concept with access from any web based device and a wider scope of features. 1. Ease of use – Leading photo sharing sites offer a great service but for the most part lack the edge of simplicity that lies at the core of PicYou. The site as as idiot proof as they come. 2. Custom filters – Our custom branded filter effects are a fun way to add an extra edge to snapshots and are a helluva fun to use. More importantly , this feature is unique to PicYou when compared with other leaders in the field. 3. Social media attributes – Features such the ability to follow other users, a customized homepage feed, the ability to “Like” other users photos, and the option to customize your profile add elements usually reserved for social networks to the mix to spice up the age old photo sharing formula.